I called V and asked where she wanted to go for dinner. She directed me to a cemetery. Seriously. 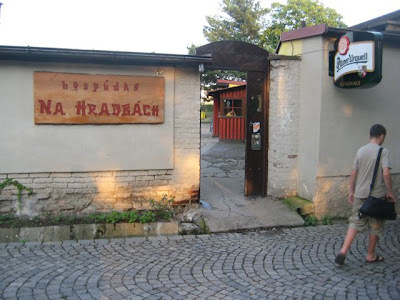 To be more precise, she wanted to go the beer garden up at Vyšehrad. 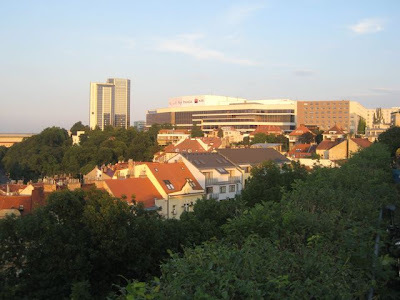 It is very close to the cemetery of Czech heroes like Antonín Dvořák, Karel Čapek, Alfons Mucha, and Bedřich Smetana. 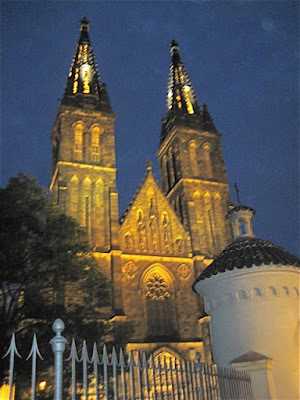 We met near the Congress Center at the Vyšehrad metro station and then walked through Vyšehrad's gates. 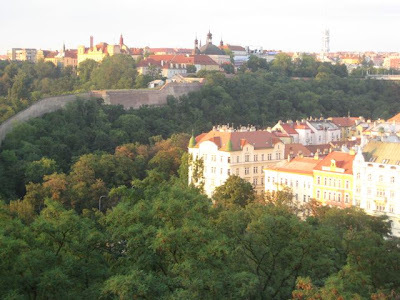 This ridge is the site of a 10th century fortress that was the original Prague Castle. We turned at the 11th century Rotunda of St. Martin and climbed the small hill. 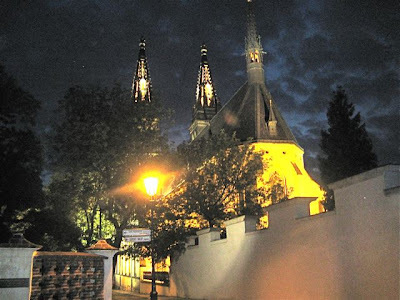 At the top is the entrance to Hospůdka Na Hradbách, otherwise known as Vyšehrad's beer garden. It was my first time at this garden of eatin'. 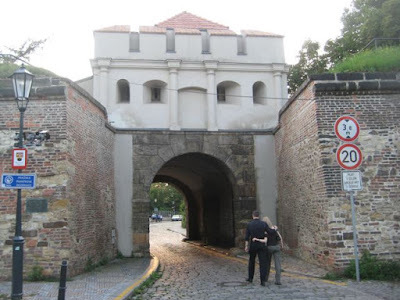 There are a number of other outdoor drinking and dining options inside the walls, so don't be confused. I'm sure most are more expensive and touristy. 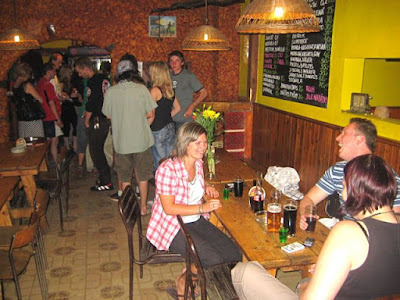 I'd been many time to the more popular and central Letna beer garden and Riegrovy Sady beer garden. 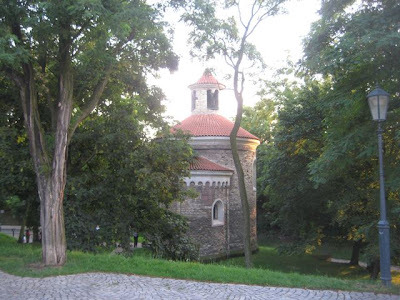 The Vyšehrad beer garden sits in a large, weedy area at the top of one of the fortress walls. There is a small pub where you can get drinks. On this particular Saturday evening, it seemed like a local crowd with few tourists mixed in. There were a few prime tables and benches with views from the walls. In one direction, you can see part of the serpentine ramparts, the Nusle Bridge and the valley. In the other direction, you can see the Congress Center, where some conventions and concerts are held. After taking in the sights, we walked over and stood in line to order our meal. 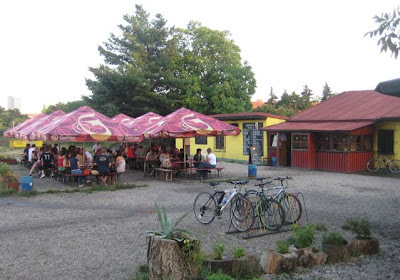 The chalkboard menu proclaimed the shack as the "Global Gigi-Migi Gril." They had a small wood-fired grill going under there. Once we got to the counter, it was about 10 minutes before the food was ready. 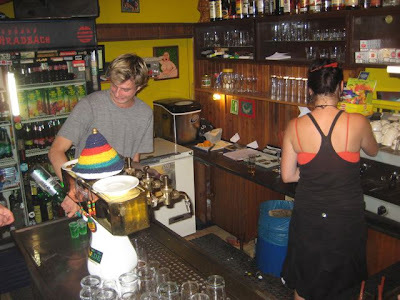 We went inside the small pub and waited on line at the bar to get some drinks. It can get a little chaotic and congested in there. They have most of the major liquors, along with soft drinks and bottled water. There were a few tables inside. They were occupied by some very drunk young people. At one point, a rather well-endowed blond stood up, peeled her shirt off, and traded it for the one worn by a skinny guy sitting across from her. I am not so familiar with this ritual outside of football matches, but found it can be rather charming in a pub setting, as well. 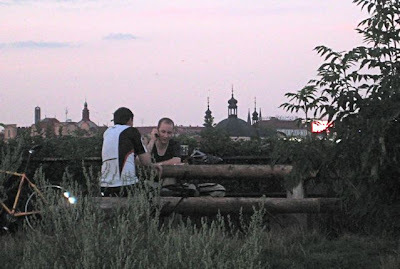 We went outside and drank half-liters of Gambrinus draft beer (23 CZK) while we waited for the food. They also have Pilsner Urquell (30 CZK). There was a wider variety of food choices than the beer garden at Reigrovy Sady. 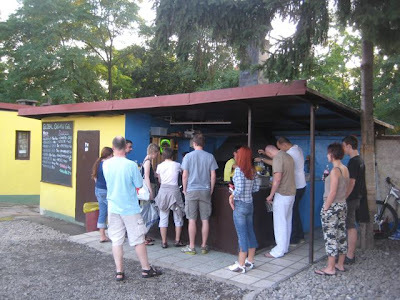 They offered a pork or chicken skewer (90 CZK), sausage (50-70 CZK), and fish (80-100 CZK). There were also a number of different grilled vegetables. 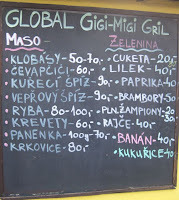 I went with the pork neck or krkovice (80 CZK). You can select your own condiments. I chose mustard, onions, and little peppers. 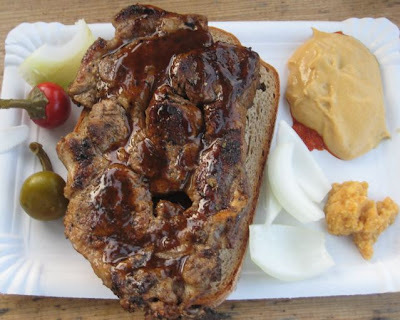 On top, I squeezed a bottle of something called "honey marinade" but tasted like cheap Czech teriyaki sauce. The meat was hot from the grill, still a bit juicy, with a little bone on one side. The pork tasted pretty good, though the sauce I added didn't help so much. 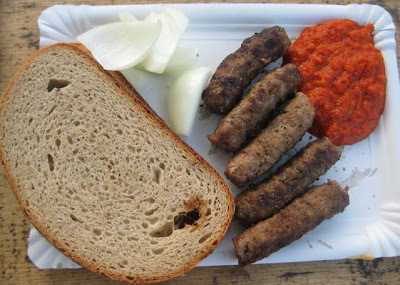 V got the ćevapčići (60 CZK), which are a Balkan specialty. The are little fingers of beef, sometimes with pork mixed in, cooked over a grill. The five pieces came with bread. They may have been OK when they were hot. These were barely warm when we got them and quickly turned cold. On the side, we had raw onions and ajvar, which is a relish made mostly from red bell peppers, along with some eggplant, garlic, and chilies. We shared some grilled vegetables. 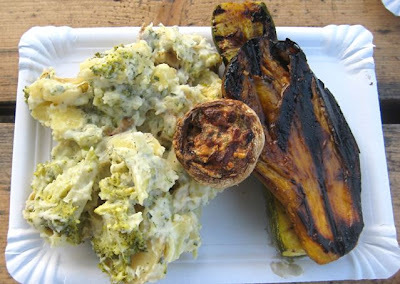 There were partially mashed potatoes with broccoli mixed in (50 CZK), grilled eggplant (40 CZK), and a stuffed mushroom cap (30 CZK). 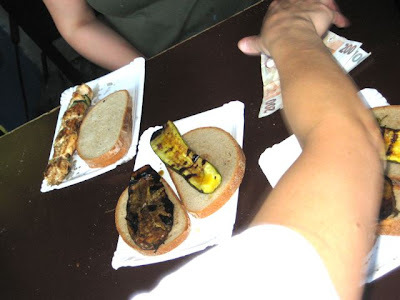 We wanted grilled corn on the cob (40 CZK), but they forgot to make it. It was all barely warm. It tasted OK, but nothing special. The eggplant was my favorite. 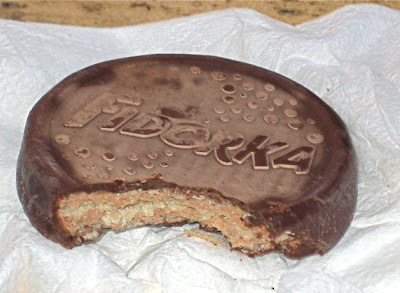 For dessert, I had a Czech chocolate treat called a Fidorka. For those not in the know, it's sort of like a round KitKat bar. 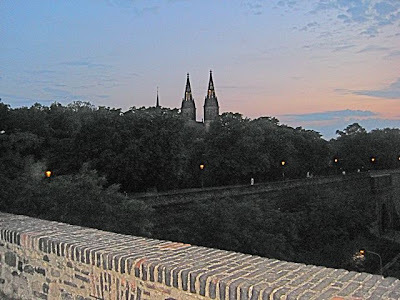 When we were finished, we went for a lovely summer's eve walk around the fortress walls. 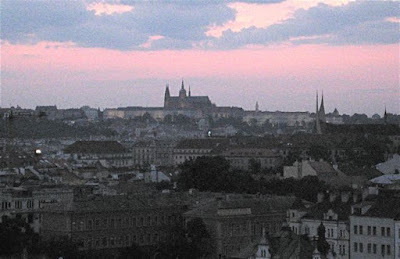 The sun had gone down behind Prague Castle in the distance across the river. A bit closer, I faintly heard something that sounded like electric guitars mixed with the sounds of bagpipes. As we walked further, it turned out my ears did not deceive me. There was a Celtic music festival going on. 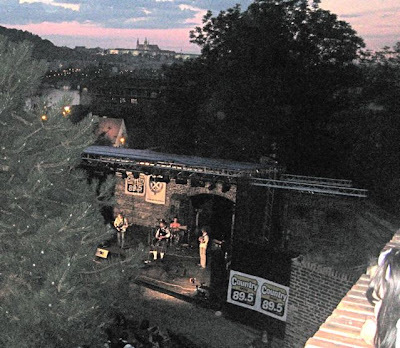 It cost 150 CZK to see the last band play, but we decided to watch for free from the wall above for just a couple of songs. After we'd had enough of that, we strolled in front of the Cathedral of Saint Paul and Peter. Then, we passed along the tops of more walls and checked out other views, including a few couples making out. Based on my experience, passionate kissing is a popular activity at these scenic spots, day or night. When we'd finally seen enough, I laid a hand on V's shoulder. "What's the best way out?" I asked. Love this blog. Not as much as I love myself, and not as much as I love other things as well, but I do! Oh and I know the comment section is not the best place for it, and there might be an answer hidden somewhere deep within the confines of the blog, but I'll just ask anyway. What brought you to Prague? Work? Woman? Wanton madness? The answer to your question, in all seriousness, is all of the above.